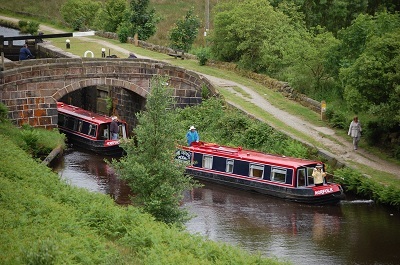 People who know their canals put the Rochdale Canal among their top canals, which is just as well because its summit is the second highest in England. It's not a specially long canal, at 33 miles, but it packs in a lot of locks - 91. It has to, with the Pennines to cross. The Rochdale Canal also packs in a huge variety of scenery, from crags and woods beside the infant Calder to views of the moors, and from stone-built hamlets, villages and small towns to vast red-brick mills and shining new tower blocks on the way into Manchester. 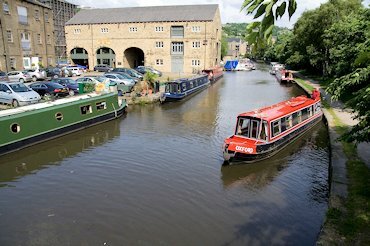 Most of the Rochdale Canal's traffic is now on the Yorkshire side, which starts right in our boatyard in Sowerby Bridge. Climbing swiftly away, via the new Tuel Tunnel Lock (the deepest canal lock in England), you soon find yourself half way up the hillside with the edge of town spread below. Then secluded wooded stretches lead to more open views as you progress up the valley. Passing through the unpronounceable Mytholmroyd, you soon approach Hebden Bridge. Some boaters stick here, absorbed by the alternative atmosphere, the interesting life, the beguiling layout of the town, piled up the hillside, and the opportunities for walks. 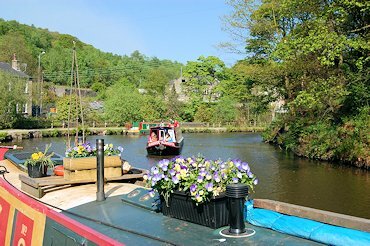 Above Hebden Bridge, the valley becomes more romantic with lots to see on the way to Todmorden, a grand small town with impressive buildings, a market and a good selection of restaurants and pubs. Todmorden is the home of Incredible Edible, so you will notice vegetables growing along the towpath for anybody to pick.Then you pass the Great Wall of Tod, supporting the railway high above, and start climbing more steeply towards the summit, with the county boundary with Lancashire just below. Across the short summit, the canal drops fast down to Littleborough, with its interesting second hand bookshop. The canal levels out for a bit, and leads through Rochdale, which is unusual for not yet having woken up to the possibilities its restored canal offers. 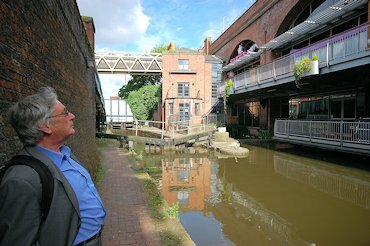 The last bit of open scenery leads you to the edge of Manchester, and an intense lock experience through alternately challenging and fascinating urban scenery leading to the impressive new buildings surrounding the junction with the Ashton Canal. A final brief descent under and past a kaleidoscope of buildings, though a much-frequented area of canalside bars, leads to the imposing end of the canal, where it meets the first English canal (the Duke of Bridgewater's) at Castlefield. 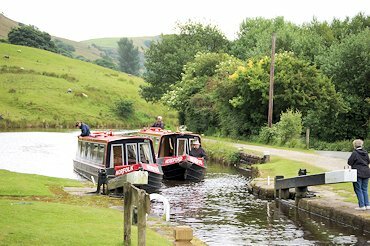 A trip across the whole Rochdale Canal is an exhilarating and unforgettable experience. see below for how get a taste of this amazing canal. First discussed as early as 1766, construction started in 1794 and the Rochdale Canal was the first of the trans-Pennine canals to open, in 1805. 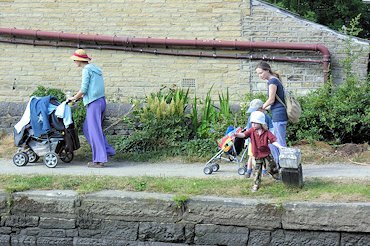 Projected as a narrow canal, it was built broad and with longer locks than the Calder & Hebble Navigation, which had reached Sowerby Bridge in 1770. The Rochdale Canal was an immediate success, carrying coal, grain from Lincolnshire, stone and merchandise of all sorts including of course the textiles for which the area was famous. Boats were a mixture of flats and keels, with their origins on the west and east side respectively - though keels would not have been satisfactory, being shorter and deeper-draughted they could not be fully loaded on the Rochdale. At any rate, it's not clear that the intermediate gates, intended to save water with the shorter boats, were ever fitted..
Traffic did well while the railway was being built alongside, but then suffered. there were also water shortages in dry summers, despite many more reservoirs being built. the blockade of the Humber ports in the First World War was never recovered from. the last through traffic was in 1937, by which time the reservoirs had been sold for public water supply, and the canal was legally closed in 1952. After a period of dreary stagnation, with bridges being dropped and long sections filled in, people who had seen the Ashton restored in 1974 said 'why not the Rochdale?'. 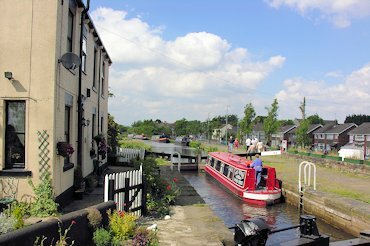 all sensible people agreed that the Rochdale could not possibly be restored, but soon local authorities saw the possibility for reopening the towpaths with job creation schemes, and before long it seemed a good idea to make the odd lock gate. By the mid 80s, all the local authorities along the route were working on their sections, and a temporary access of money when the county councils were abolished allowed some serious blockages to be removed. The outer Manchester ring road (M60) was planned to obliterate the canal, and somehow the Rochdale Canal Society, local authorities and other objectors managed to get this threat changed into the construction of 1km of new canal through a motorway intersection. After that it was only a matter of time, and by 2001 the Rochdale Canal was open from end to end. The reopening has enabled and encouraged many millions of pounds of property development, refurbishment and other regeneration, so the public money invested is earning a good return. 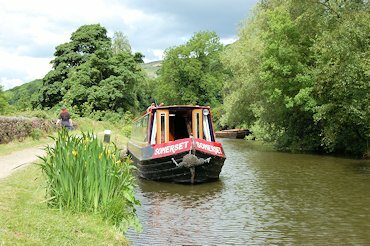 And local people make very good use of the canal in many ways, of which boating is only one.